William Arnal | Amazing Lookalike! On the left is William Arnal, Professor of Religion at the University of Regina. 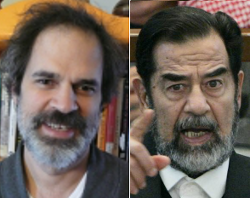 On the right is Saddam Hussein, President of Iraq 1979-2003 and victim of a brutal US invasion.